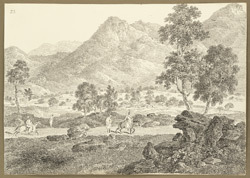 Pen and ink drawing by Sir Charles D'Oyly (1781-1845), of the Chittru Pass near the village of Chittru Chatta in Bihar from an Album of 80 drawings of views in Bengal and Bihar taken between January 1823 and May 1825. The largest group of drawings consists of sketches made between 26 January and 27 February 1823 during a journey from Calcutta to Gaya (Bihar) along the 'New Military Road'. This road passed through Manbhum district (Bihar) to Hazaribagh (Bihar) and through the hills to the N.W. to join the present Grand Trunk Road near Sherghati (Gaya district, Bihar). Begun in 1782, it had semaphore signalling towers built along it in the early years of the 19th century. This is the original drawing for plate 8 of 'Sketches of the New Road in a Journey from Calcutta to Gyah' (Calcutta, 1830). D'Oyly wrote, "Emerging from the picturesque pass...the ground becomes comparatively level, and the eye enjoys a fine view of the receding range of hills partially covered with vegetation and brightened by a thousand varied tints thrown upon them by the morning sun: on each side of the road are large blocks of dark granite, and in the middle distance, the pretty little village of Chittroo Chutta, situated amidst a luxuriant patch of cultivation finely contrasted by the grandeur of the Hills beyond it. This village is 223 miles from Calcutta."